Hey ya’ll! Let me just say, I’ve been reading the comments as they come in for the giveaway post, and it’s been so much fun! And really depressing, because I would seriously like to give everyone a bottle. We’ve already gone over what I had originally planned for giveaway #2 and it’s only the second day of the first giveaway- so I think I’ll just play that one by ear! So I’m not sure what has taken me so long today to get things moving with this post… I made the mistake of not doing my nails last night, and then I just kept putting it off to do things around the house, clean, etc. Time REALLY flits away too quickly! Since I’d already been too lazy to start last night, I knew today would have to be something fun but fairly straightforward- no attempting my first ever water marble today! 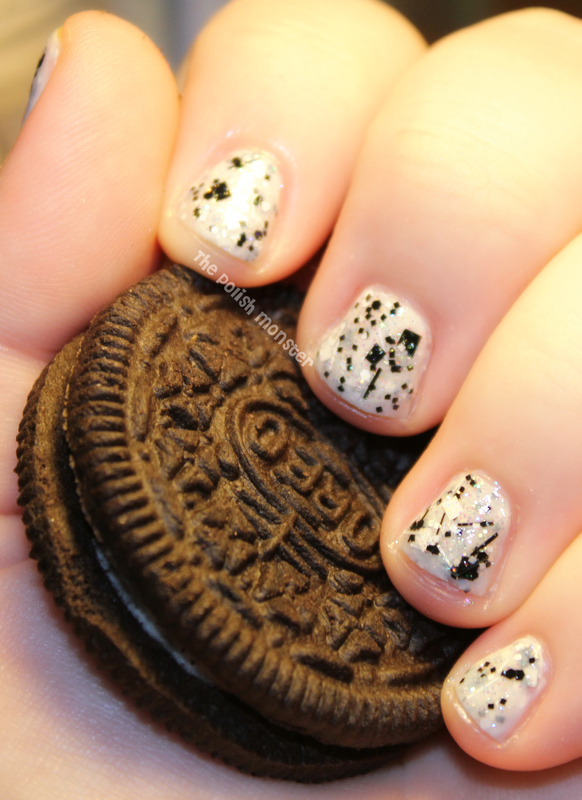 I’ve had this Oreo Jelly Sandwich mani from Sarah at Chalkboard Nails pinned on Pinterest for a few weeks now, and I decided that would be fun to do. I just LOVE the way it looks! So this is a borderline Mani Monday FAIL. I used Essie Marshmallow and Lush Lacquer’s Salt N’ Peppa- 2 coats of each, alternating. First, while I LOVE Salt N’ Peppa, it didn’t lend itself well to this look. It would probably look amazing on longer nails, but with my tiny nubs (one chipped again the other day, so back down to the quick) it just didn’t look that great. I think if I get my hands on Samurai Princess, like Chalkboard Nails used, it would look better- or if I had used Valentino from Pretty & Polished. I just couldn’t achieve much of a jelly effect- the top glitter coat completely covered any of the under coat. Plus, since my nails are so short, 4 coats of polish made me look like I was wearing nub-acrylics. And even with top coat, it wouldn’t dry. I took the photos, and then removed it. Long story short- I still LOVE this look, but just couldn’t pull it off for this post. I’m going to try it again with another glitter and maybe update again. Ok, so I guess you CAN see some of the jelly effect. Its very, very subtle though. I found it serendipitous that we had Oreos in the house… normally my husband inhales them within 24 hours of purchase. I think my only major complaint is that it looks like I basically added a topcoat over white- the jelly effect is lost. I will try again! Don’t forget to enter the giveaway! Just check out yesterday’s post for more details! This entry was posted on July 2, 2012 by The Polish Monster. 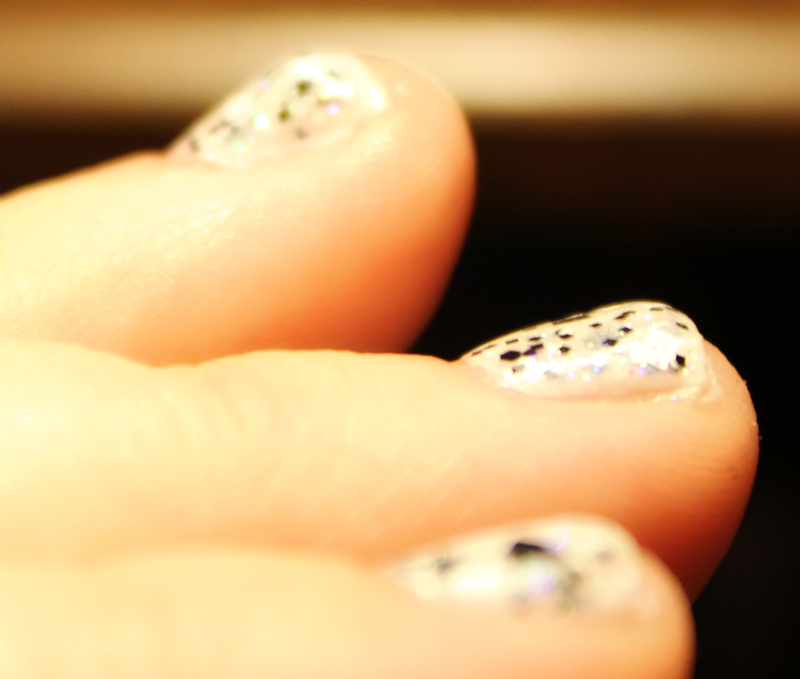 It was filed under Uncategorized and was tagged with Essie, glitter, indie, jelly sandwich, Lush Lacquer, Mani Monday.